Initiated by the Singapore International Arts Festival 2015. Singapore International Arts Festival 2015. Presentation of 25 min video First Skin produced as part of the Archive Box Project. 29 August and 5 September 2015, 8pm. Location: 72-13, Singapore. The highlight of Dance Marathon – OPEN WITH A PUNK SPIRIT! is undoubtedly the Archive Box. Each of the seven Japanese dance-makers (the Archivists) have archived one seminal dance of theirs in a Box of influences and inspirations. These Boxes were recently introduced to another seven dance-makers (the Users), who have never met the Japanese artists before. The Users are each invited to create a response to a specific Archive Box. Together with dance dramaturgs Nanako Nakajima, Muto Daisuke, Margie Medlin and Festival Director Ong Keng Sen, all 14 dance-makers have embarked on this blind date of sorts. In the spirit of copyleft and creative commons, the Users’ responses and the Archive Boxes will be unveiled on two exciting evenings, 29 August and 5 September 2015. In the early 1900s, scientific research and analysis of biomechanical movement was profoundly informed by photographic recording and the light machines used to reproduce the movement studies. I think of this early portrayal of the relationships between time, light and organic chemistry as parameters for choreography. Sadly, in the era of the ceaseless technological upgrade, celluloid as a medium is no longer supported. The projection of film by a light machine is almost part of a bygone era. Overtaken by digital projection technology, 16/35 mm films are no longer printed for cinematic release. In fact, people under 30 express nostalgia when they hear the sound of film being pulled through the sprockets of a projector, even though they do not recognise the actual projection machines. What have we lost? In this performance, a live projection work pays homage to the art of cinema and experimentation between movement, time, light and space. The space will become a kinetic sculptor, with me moving inside it like the ghost in the machine threading together a dance film archive. Featuring a duet between a live dancer and a virtual dancer this project explores the complex relationship between the real and the virtual. The choreography investigates the interplay between the camera and the dance, by creating choreographies and uses the combined capacity of dance and film to convey the qualities and feeling of the movement to the viewer. EXHIBITIONS: 2007 Spring Dance Festival, Sydney, Australia. 2003 Future Cinema, Kiasma Museum of Contemporary Art in Helsinki. 2003 Media Festival Bangalore, India. 2003 Screenings in Cuba, Chile and Costa Rica 2002 Future Cinema ZKM, Center for Art and Media, Karlsruhe, Germany. 2002 Tanzmediale, Cologne, Germany. “Miss World” is the title of an installation by Australian-based artist Margie Medin, created in 2002 in collaboration with the Karlsruhe centre for art and media technology and last shown at the tanzmedial exhibition in Cologne. 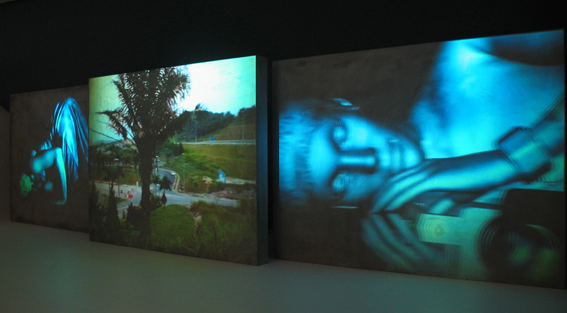 A monumental triptych made out of three concrete walls, the work draws from the spectator involuntary comparisons between the images projected on to it: on the right-hand wall, a dancing female cyber figure and on the left, slightly unsynchronised film of a real woman dancing the same way (choreographed and danced by Rebecca Hilton). In the centre, we see images of spoiled landscapes and ugly urban development which would quickly lose their fascination if one did not realise that these images are moving in the same way as the women – the camera is dancing. In Medin’s work, which the spectator is intended to perceive through identification and empathy, just like stage dance, camera and dancer blend into one; the camera becomes an appendage of the body. Medin is drawn to dance because of its “intellectual and emotional information without a text basis”. While “Miss World” addresses numerous issues, from the cult of physical perfection to the role of technology in society and the brutal urbanisation of the natural environment, it is primarily a highly intelligent reflection on dance through the media of new technology. 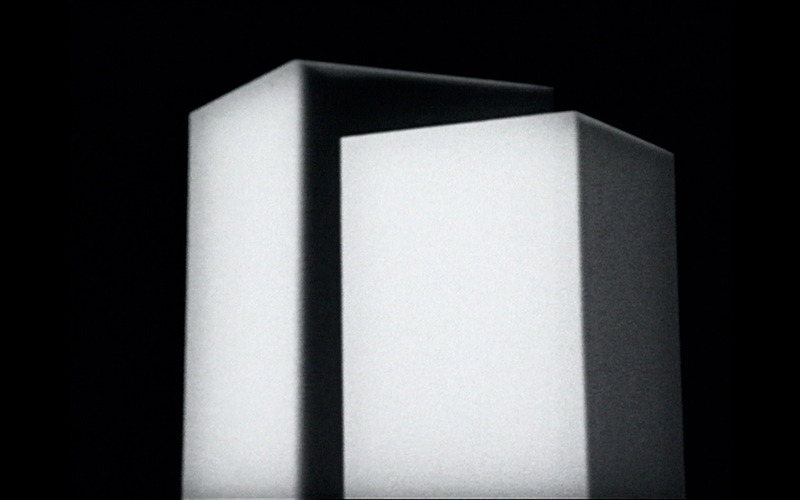 Four films about space and movement, directed by Jacqueline Everitt, Stephen Bram, Margie Medlin and Ben Anderson, produced by Margie Medlin and Ben Anderson. 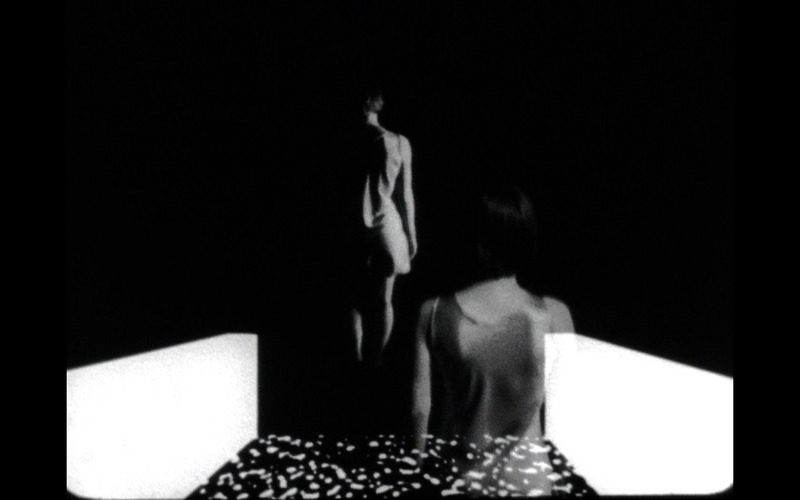 EXHIBITIONS: 1999 Antistatic at the Performance Space, Sydney. 1998 The Australian Centre for Contemporary Art, Melbourne. The locations within this city are The Transit Zone, The Market Place, The Deportation Centre, The Border Town and The House. The city plan and each location are based on plans from other sources. The work, Mobility in an Artificial City, draws attention to the emotional interactions of inhabitants to different spaces. EXHIBITIONS: 1998 Troisièmes Reconcontres Internationales Art cinéma/ vidéo/ Coordinateur, Paris. 1997 Body Works Festival, Dance House, Melbourne. Asian Dance Festival, NYC, USA. 1997 Tollwood Festival, Munich. 1997 Art Space, Sydney. 1996 Green Mill Festival, Melbourne Town Hall. Informed by developments in the fields of physiology, computer science, real-time software development and engineering, this multi-media event was the culmination of several years’ collaborative research. It investigated the kinesthetics of music: determining movements that produce sounds that in turn produce new choreographies. Quartet aimed to present a versatile and flexible creative process for experimenting with cause and effect in multiple media; an insight into what it means to transform one medium or gesture into a completely different one; a redefinition of interaction through music and dance. Quartet was funded by a Sciart Production Award (2005-2006) from the Wellcome Trust, in collaboration with the Physiological Laboratory, University of Cambridge. It was co-produced with the Performance and Digital Media Department of the Institute of Contemporary Art, London (ICA). Other funding partners include the Arts Council of England, the Arts Victoria Cultural Exchange Programme, the New Media Art Board, International Community Partnerships and Market Development of the Australia Council for the Arts. Quartet was partly funded by a Sciart Production Award (2005-2006) from the Wellcome Trust, in collaboration with the Physiological Laboratory, University of Cambridge. Quartet is co-produced with the Performance and Digital Media Department of the Institute of Contemporary Art, London (ICA). Other funding partners include the Arts Council of England, the Arts Victoria Cultural Exchange Program, the New Media Art Board, International Community Partnerships and Market Development of the Australia Council for the Arts. IN PROGRESS RESEARCH SHOWING AND DISCUSSION. & FEBRUARY 5TH AND 6TH AT THE ICA, LONDON. 2000 “ESTATE,” Urban design, video installation. Public projections at the Melbourne Town Hall. In conjunction with Melbourne International Film Festival. A film about contemporary jazz music. Produced by Lucas Produkzions. For the Aboriginal and Island Commission of the Australian Council of Churches in. A presentation to the World Council of Churches 7th Assembly in Canberra on the 14th February 1991. The plenary was a combination of 14 speakers, the band Yothu Yindi and a 70 min slide and video presentation. All the elements gelled in a powerful documentary of Aboriginal & Islander experiences since white people first claimed Australia. The script was written by Anne Pattel-Gray of the Aboriginal and Island Commission of the Australian Council of Churches. Technical Co-ordination Australian Broadcasting Corporation acting as the Host Broadcaster. 1988 Director of Photography lighting assistant for three short films produced at the New School for Social Research, New York City, New York, U.S.A.
A multi-projection performance, The Performance Space, Sydney. 1986 Technical Assistant “CITY PROJECTIONS” By Krzysztof Wodiczko. Produced by Ian de Gruchy. Adelaide Festival, Artist Week.